Every pilot has at least one reason to fly. In fact, I would hazard that the majority have more than one reason that they were initially drawn to flying. I know I do. I get the question a lot from curious folks: "What attracted you to flying?" Others will answer along the lines of "more efficient travel," "it's my job," or "I read Jonathan Livingston Seagull and I was hooked,"but in the interest of concision I have distilled my response down to a minimalist answer: "I like airplanes." It's short, sweet, and has the benefit of being utterly honest. I developed a fascination with airplanes when I was six years old. Not "flying," mind you, but "airplanes." It was part and parcel with an interest in operating machinery. I recently came across a little book my mother used to keep for each of her children, of which I was the middle of three. I found in that book that when I was five or six years old, my career goals were recorded as "Astronaut" or "Gas station attendant." Honest truth! Ha, kidding. That one is obvious. The thing about the gas station attendant, though, was that even at that age I was smitten with operating equipment. I just wanted to run the gas pump! That career path was, as we all know now, rendered moot soon thereafter. Ironically, I now hate pumping gas. I provide this snippet of autobiographical data to set the stage for the remainder of this story. The wife and I are considering buying a winter home in Florida, but one potential drawback of being down south during the inclement months is that it would be difficult to visit my father. I was relating that concern to a friend of mine and was describing the budgeting process I had gone through to determine the monthly airline and rental car costs associated with making visits. His response was along the lines of "Why would you want to do that??" While I was trying to understand why visiting my father would be a questionable activity, he said, "Why wouldn't you just fly your plane?" That left me just as speechless as his first comment. Why? Because the though had never crossed my mind! I fly because I like flying the airplane, not because it's (sometimes) a more efficient way to travel. Sure, I make day trips and give lots of rides, but I have never thought of the airplane as a travelling machine. I decided to give it a try. The friend that woke me to the idea of Ohio-to-Florida happens to live in Florida and has often offered to host me for as long as I want if I ever travel down that way, so I decided that would be the perfect way to introduce myself to long-distance (well, 600nm) flying. Given that my longest flight ever, across almost four decades of flying, was a trip to Oshkosh in my RV-6 more than a decade ago, and the furthest I had gone in the RV-12 that replaced the -6 was a 100nm day trip, this was no mean feat to consider. The thing about about flying any appreciable distance in a small plane is that it is NOT just a collection of 100nm flights taken contiguously; it's not a question of enduring the distance, it's a question of dealing with a potential six (or more) different weather systems. Considering that weather is my personal #1 challenge/fear in flying, this is no small thing to consider. I have found that a strong tonic for personal trepidation is planning - lot's and lot's of planning. The first decision to make was fuel stops: how many, and where? Deciding the "how many" was the first order of business. I could make three 200nm legs, or two 300nm legs. That's a pretty straightforward napkin-math equation: the most likely fuel burn, as provided in the Van's performance charts, is 4.0 gph at 5,000 rpm and 5,000' density altitude. That does not, however, account for the fuel used for the takeoff, climb, descent, or reserve. At 5,500 rpm, the projected burn rate rises to 5.0 gph. The projected airspeeds at those values range from 101 - 114 knots (TAS). For my planning, I used 100 knots and 6 gph to make the math easier. I also selected these values as a reflection of the conservatism I adopt when faced with the relative unknown. It's not that I don't trust Van's calculations, mind you, it's more that I don't trust myself to do everything correctly and as efficiently as theoretically possible. And, of course, the weather gets a say in that matter too. Burning six gallons per hour would take 18 of the 20 available gallons for a 300 mile leg, but would leave me with less than the mandated 30 minute reserve, which I conservatively bump to 45 minutes. The one-stop plan would have to wait until I become more comfortable with this kind of planning/flying. With the two-stop decision made, I used airnav.com's fuel planner to find a route: KTZR → KBYL → KCTJ → 2R4. "Pee bottle" was a last minute addition, and took the form of a couple of Travel John packs, just in case the fuel capacity exceeded my bladder capacity. With the things I can control taken care of, it was then a matter of waiting for the perfect weather, which in this case I defined as "CAVU the whole way." When that day arrived, I went. The first leg would have been as easy as pie, had I not run into a difficult decision: about 20 minutes out from KBYL, I had to decide whether one of the Travel John packs was going to finally achieve its career goal, or whether the operation would be so constrained by the tight quarters of the RV-12 to the degree that I'd be just as well off waiting. I chose to wait. About ten minutes later, when the options had dried up (so to speak) and the FBO building was the only recourse, I remembered that it was early on a Sunday morning and the FBO building might be locked. The second leg was notable only for altitude flown (8,500') and a tailwind that ranged from 20 to 35 knots. As happy as I was for the tailwind, I could only wonder how bad it would be as a headwind on the return flight. But that was days away, so I didn't spend too much time thinking about it. The fueling at West Georgia went easily, and had the benefit of being Mogas. I wish more airports would get it. Ground speed 146 knots! It peaked at 148. The third leg would include the arrival into Peter Prince (2R4) which is somewhat complicated by the surfeit of restricted airspace, large MOAs, crazy amounts of student traffic, and an airport sitting in a two-mile diameter notch in the Whiting NAS Class C space. As a final wrinkle, 2R4 has left traffic for runway 36, and right traffic for 18. I would have to be careful in how I managed the landing pattern. Studying the sectional, I decided that the most conservative approach would be to utilize the channel that runs between the restricted area on the east side and the MOA on the west side and make sure to stay below the 1,400' shelf of the outer ring of the Class C around Whiting. 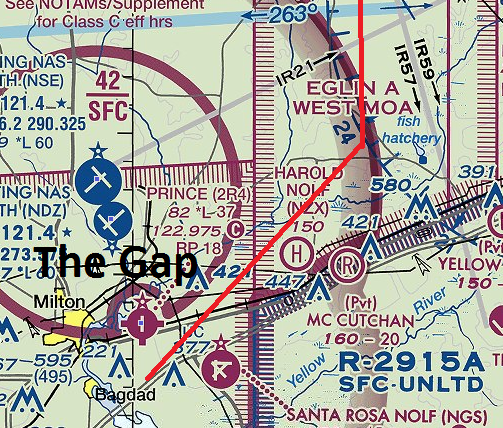 Once mostly south of the Whiting Class C, I would just have to shoot the two mile wide gap between the inner ring of the Class C and the restricted area. Yes, I could have contacted Pensacola Approach, but local knowledge gleaned from interviews with local residents indicated that I would end up with the same kind of "skirting" approach, but with the additional stress of knowing someone was actually watching. In the event, the Dynon Skyview, for the umpteenth time, earned its keep. Just flying the little airplane between the lines was no more difficult that playing a simple game on my iPhone. It did make me wonder, though, how we were able to do things like this in the pre-GPS era. I spent a couple of days in Florida, the highlight of which was a trip to Pensacola NAS to watch the Blue Angels practice and to visit the terrific Naval Aviation Museum. As much I love the USAF museum in Dayton, the naval air museum wins hands down: no cordons around the airplanes, and much better lighting. After just a couple of days there, the weather looked favorable for the return trip, so I decided to head back. Note that by "favorable," I do not mean "perfect." It was time to add a little bit more challenge, which came in the form of a less-than-perfect forecast for Ohio. The first two legs were just as easy as those of the trip down to the south, but the last leg from Kentucky to Central Ohio required some decision making. Most of the salient portions of the state of Ohio were reporting VFR, but there were a couple of airports, conveniently directly on my preferred route, that were steadfastly refusing to go from IFR to VFR. Again, the Skyview was a great enabler. 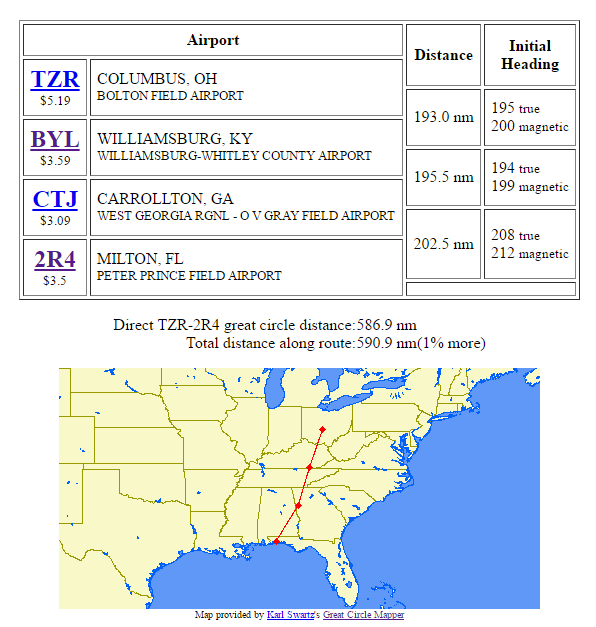 While sitting on the ground in Kentucky, I was able to check the most recent conditions at every airport that mattered, and determined that if my preferred route didn't work, I could detour to the east or west to get past the areas in question. I hadn't been in flight long before the recalcitrant airports went from IFR to LIFR to Marginal VFR to good-enough VFR. As I flew over the hills of southern Ohio, I had a few minutes where good-enough VFR had me flying at a lower altitude than I would have preferred, but I was still legal in the eyes of the FAA and made comfortable by the fact that I could see well into the distance. It wasn't pretty, but it didn't need to be. The final tally was 5.5 flying hours down, and 6.1 coming back. I got back faster than I had thought I would: not only did I fly a 600nm trip for the first time ever, I also had another notable happening: I had tailwinds BOTH WAYS! So you broke the distance barrier, did you? Congratulations on a flight well flown! It's always great to log that kind of success. Great pictures, too. You got your own personal Blue Angels airshow and that's a wonderful thing. I didn't buy my 115 knot airplane intending to use it as a traveling machine. I have found over the years, though, that there's a sweet spot in the 2-4 hour flight time range (in lieu of a 4-8 hour drive) where my not-so-amazingly-fast airplane serves pretty well. Any trek longer than that becomes something more of an adventure, but those adventures have been well worth having when the weather permitted. I really enjoy your blog and excellent writing. I understand you have military experience and I may not be telling you anything you don't already know, but I've found that flight following is a great asset in this airspace I fly through the panhandle fairly regularly as I live in NE Florida and have family in South Mississippi. When flying the area using flight following, not only do you get traffic advisories, the controllers are aware of actual activity in the military airspaces and will often clear you direct to a waypoint/destination or suggest a routing/altitude etc to help avoid some of the anxiety of inadvertently entering military / restricted airspace. 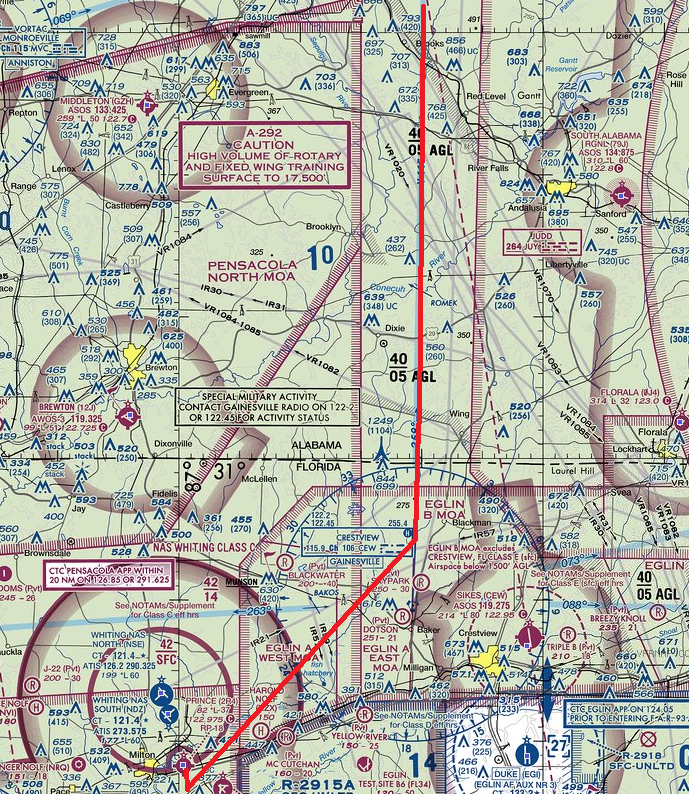 If you're talking to them and you get vectored, it's safe to assume you're OK to enter airspace the vector takes you into (the only exception is Class B where a definitive "cleared to enter" from a controller is required.